“Jean-Baptiste Camille Corot was born into a well-to-do family of retailers who ran a dress shop located on the corner of the Rue du Bac and the Quai Voltaire, and who supplied the Tuileries. He followed his father’s wishes by becoming a salesman at a draper’s, while also attending the Swiss Academy in 1817. Determined to become a painter, he managed, with some difficulty, to persuade his father to give him an allowance of 1500 livres so that he could devote himself to his studies. In 1822 he became a pupil of Achille-Etna Michallon (1796–1822), but his teacher died prematurely (he was just three months younger than Corot) and so Corot joined the studio of Jean-Victor Berlin. Throughout his life Corot travelled for his art: he made three trips to Italy, the first from 1825 to 1828, the second in 1834, and the last in 1843. Following his return to Paris in 1828, he visited Fontainebleau and Normandy, with a trip to Brittany the following year. At the time of the three-day Revolution of 1830 he was in Chartres, before traveling on to Normandy, visiting Dunkirk, Boulogne, and Berck. He then travelled to Burgundy and explored the Nivernais and the Auvergne. 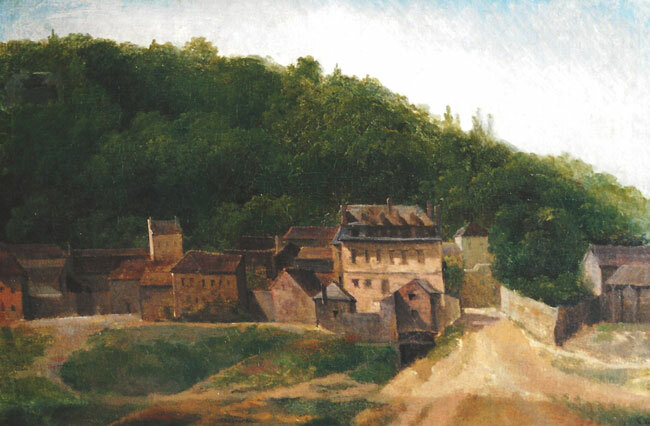 Corot frequently stayed in Arras with his friend Constant Dutilleux, who often accompanied him on his travels. His many expeditions took him to the Morvan, near Dijon; to Switzerland in 1841–1842, a country to which he often returned with his friend Charles-François Daubigny; to the Netherlands in 1854; to London in 1862; and to Auvers-sur-Oise in 1868, among many others. Among his favorite places was Ville-d’Avray, where his father had bought a house in 1817. From 1827 Jean-Baptiste Camille Corot participated regularly in the Paris Salon, although he had paintings refused in 1843 and 1847. He gained a first-class medal in 1848 and in the same year became a member of the Salon jury and a member in his own right. He featured in the Exposition Universelle of 1855 in Paris (where he received a first-class medal), in the London equivalent in 1862, and in Paris again in 1867. He was made a Chevalier of the Légion d’Honneur in 1846 and an Officier in 1867. His first attempts at painting demonstrate an adherence to the doctrine of Neo-Classicism, but this changed once he began to paint in the open air and take an interest in the landscape itself, something that was to be more fully developed on his first trip to Italy. His views of the Forum and the Colosseum, as seen from the Farnese gardens, are among the first he painted in 1826 and show architecture and nature in perfect equilibrium under the warm Roman sun. Corot was amazed by the intense quality of the light, which he struggled to re-create in his work, finally achieving a beautiful limpid quality in landscapes such as Narni, the Augustin Bridge over the Nera. This masterpiece was in fact simply a study for the painting View from Narni, which he sent to the Salon of 1827. When one looks at these two works, one can begin to understand the reasons behind the disagreements between the defenders of the ‘pre-Impressionist’ Corot and the critics who see him as a painter of Neo-Classical landscapes. The study in oil allows Corot a freedom of expression that leads him to make rapid brushstrokes in the foreground, avoiding detail, before using patches of black in the middle of the composition to bring out the conflict between light and dark and highlight the play of light on the bridge and the water, resulting in a diffused light over the distant bluish mountains. The definitive painting, however, shows nature reconstructed in a manner reminiscent of Claude Lorraine, depicting a pastoral scene in a manner intended to demonstrate that he has reached artistic and technical maturity. At the same time Corot was producing studies of figures, portraits of Italian men and particularly Italian women, using plain backgrounds that accentuate the costumes and sensuality of his models and highlight their appealing simplicity. The combination of artificial composition and broad brushstrokes would only come together again in the series of single figures he painted for their own sake, and which he never showed. On his return to France, Corot painted landscapes of views seen on his travels to Normandy, Brittany, the Ile-de-France, Ville-d’Avray, and Fontainebleau, as well as several portraits of family and friends. Some of the landscapes painted between 1828 and 1834, such as Chartres Cathedral (1830) and View of Soissons (1833), are designed to explore the relationship between the main subject and its setting. The cathedral is seen in the background, partly hidden by a hillock and a pile of stones, yet is still depicted with fine detail. The view of Soissons is equally surprising because the towers of the church of St-Jean-des-Vignes stand out clearly at the rear of a panoramic landscape. The two paintings Corot submitted to the 1835 Salon after his second trip to Italy, View at Riva, the Italian Tyrol and Hagar in the Desert, demonstrate two different concepts of landscape. The titles themselves define the different genres: one shows a landscape painted for the pure poetry of the place; the other is a dramatic biblical subject. Yet the View of Riva is just as detailed as Hagar in the Desert. One only has to compare the finished work submitted to the Salon with the oil study showing the same view: reeds have been added in the foreground and a tree added on the left to balance the one on the right, while the little shrine, lightly sketched in the study, is presented clearly in view and a small figure faces the viewer. The whole painting has been reconstructed to bring out the strange luminosity and poetic lyricism of the reflections on the water. On the other hand, the hard light that illuminates the landscape in Hagar in the Desert is there to evoke the drama enveloping Hagar and her son, chased into the desert and on the point of dying of thirst until an angel intervenes to save them. The protagonists have only a small place in this vast dramatic landscape and, as Charles Lenormant wrote at the time, ‘M. Corot’s landscape has something which grips the heart long before one becomes aware of the subject. That is the true merit of the historical landscape: the harmony between the place and the passion or suffering that the painter wishes to put there’. According to a more modern view of Corot’s work, the true subject of these two works is the landscape, which, as Corot saw it, is at once classical in its elaborate composition and lyrical and poetical in the rendering of the light; these two qualities combine to produce a work far removed from the true Neo-Classical historical landscape. Corot also painted figures, generally melancholy in tone. Around 1840 Corot made a number of studies of nudes, mainly drawings, that echo Ingres in their line. One of the most exceptional of these is Roman Odalisque or Marietta (1843), which shows a rich variety of pinks, ochres, and skin tones, with contrasting flat and textured surfaces and contours, both accentuated and only suggested. These figures are not strictly speaking true portraits, as is the case in the series of drawings of monks from 1850 onward, such as Carthusian Monk Reading (1850–1855), which evokes the intensity of the meditation with its strong, vigorous brushstrokes. In all these works Corot used a sober palette that caused Baudelaire to write, ‘He knows how to be a colorist with a limited range of tones’. 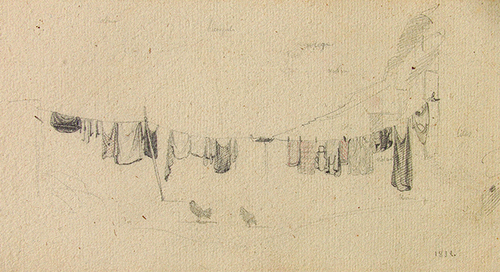 Both his drawings and his etchings demonstrate a development toward an increasingly free style. At the exhibition Corot, 1796–1875 in Paris in 1996, the Bibliothèque Nationale showed the original glass plates from which prints were made by the cliché-verre process. This technique was developed after 1839, and Corot employed it many times between 1853 and 1874. Corot also created decorative paintings, notably at the church in Rosny-sur-Seine, for which he painted a Flight into Egypt in 1840 and a Road of the Cross in 1856. In collaboration with his friend Richomme, he also decorated the transept of the church in Ville-d’Avray. Most of his decorative work was executed for those within his circle, for example for Decamps’ studio in Fontainebleau and for Fleury’s house in Magny-les-Hameaux. While he was in Switzerland, in 1857, he decorated a salon in the château at Gruyères (Fribourg). In 1865 he painted two panels to decorate the dining room of Prince Demidov’s private house in Paris. It could be said of Corot that he was ‘a modernist in spite of himself’, having been attracted to and nurtured by classicism, but having taken the path that led to Impressionism, without actually joining the movement. It is worth remembering that he died one year after the first exhibition of Impressionist paintings at the studio of the photographer Nadar (1820–1910). Although a painter-poet and dreamer, Jean-Baptiste Camille Corot was almost exclusively seen as a landscape artist, owing to a misapprehension brought about by the artist himself, who only exhibited landscapes at the Salon and hardly ever showed his figure studies, which were finally revealed to the public at the Salon d’Automne of 1909. The latter, notably those in the Studios series, are of very high quality, but brought Corot close to the art of realism, to which he was opposed, having little regard for either Jean-François Millet or Édouard Manet. He was not, however, an isolated artist: one has only to look at the number of painters who either were or claimed to be among his pupils, including those as different as Antoine Chintreuil, Stanislas Lépine, Berthe Morisot, Alfred Sisley, and Camille Pissarro” (Benezit, Dictionary of Artists, Gründ, 2006). Please contact us if you are interested in selling your Jean-Baptiste Camille Corot paintings or other artwork from the 19th century and early 20th century.